Home > In The News > A Fast Flax Fact, from the Flax-Lady! Is your Cholesterol getting you down? Are you “trying” to eat right, and just never seem to see results? Well, I am going to suggest just one simple change to your diet, Add Flax! This is simple, straightforward, and doesn’t involve purchasing exotic ingredients. Just 2 tablespoons of flax will help to reduce your cholesterol level! 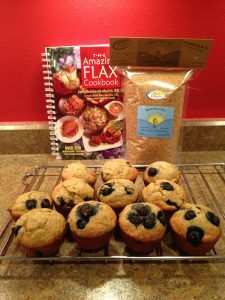 One way to incorporate flax into your diet is to eat Flax Muffins. Ground Flax added to muffins has been shown to lower total Cholesterol by as much as 27%! The fiber found in flax binds with cholesterol rich bile acids and carries them right out of your body. Tomorrow is the first day of the rest of your life…start it by taking a a positive step for your health! ……Fresh from our farm to your home….